Mihal is from Bethesda, MD and is a student at Walt Whitman High School. She is attending the AMHSI December 2014 session. I caught up with Mihal for a few minutes and had a chance to hear how her Israel trip is going so far. 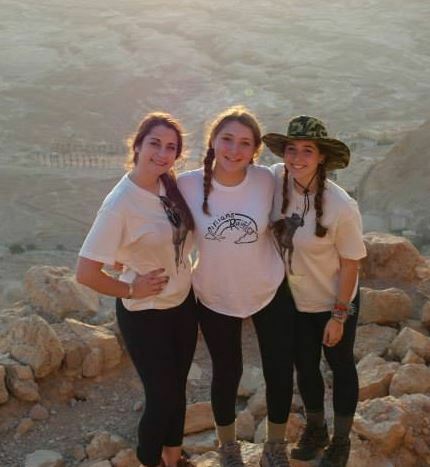 Mihal (center) with friends from her program on a hike in the Negev. Q: Is this your first time in Israel? A: This is my first time here; I came here not knowing what to expect, just with ideas in mind of what I’d seen. It has really exceeded my expectations and it’s breathtaking. I hope to continue to see new things and experience Israel in my own way. Q: Why did you decide to come on the program? A: My sisters both came to Israel on AMHSI. One, six years ago and the other one, three years ago. I had heard good things about the program and the connections you make on the trip from them. I was also attracted to how much learning they did on the trip. I think the program impacted their lives tremendously. My sisters are more educated about their Jewish past and heritage and that’s something that everyone should be educated about. This is an excellent way of doing it, especially by living through the history. Since the program, my sisters have been more attracted to the Jewish religion and more connected with it; they feel that they have another place that they can call home. Q: Do you have family here? A: My grandmother escaped Poland during WWII and Nazis, her family went to Argentina. Her sister came here from Argentina. These are my dad’s cousins and their kids were in the army. It was interesting to see how my dad’s cousin talked about sending her kids off. She gave an example about how the army has provided them real tools, saying that [her son’s] memory is impeccable from the army as he was always dragging things around in the pitch black! Personally, it’s not something that I would do but I have a lot of respect for the people that do go to the army. Q: You participated in an interfaith exchange program in 2011. A: In Hebrew school, we study different religions so we went to visit churches and mosques. Some of the exchange students came and talked to us about their own experiences and how religion impacts their daily life. It was interesting to see how they connected to their religion because for us, at that age (13/14), we were in Hebrew school because our parents had sent us there. It was interesting to see how dedicated they were by choice. Q: Did participating in the program impact how you see Israel? A: I was able to see how other religions visited [Jerusalem] and it made me curious regarding other sites like the Dome of the Rock. [When we visited the] Western Wall tunnels, we could hear the call to prayer. Our teacher had to explain what was going on but I already knew what it meant and what they were doing. Q: Kol Shalom’s synagogue at Rockville, MD has been selected to receive Rockville’s Environmental Excellence Award for 2014. Your dad designed this building. Why do you think that he chose to design a synagogue? A: My dad tries to connect architecture and to show how the whole building has meaning. When he takes me to his buildings, I can never imagine how they can hold so much meaning. Everything is connected to the Torah and Jewish religion. When you look at a building you think it’s just a building but he finds a way to connect it [to Judaism]. Even the entrance; how it’s shaped into a chai. Everything is so well thought out! He’s received several awards for green buildings and this one is LED Gold certified. It’s still not finished and their planning on expanding it. Q: Do you want to be an architect? A: I have thought about being an architect and it’s at the back of my mind. It combines art and math. But I’m not sure, at all! Q: Do you have any special memories from the program so far? A: The first day we were in Jerusalem, they took us to the overlook; my eyes were closed so I couldn’t see anything when I got off the bus. It was surreal when I opened my eyes – I wasn’t expecting to see anything at all; it was breathtaking. At the Western Wall, I didn’t think I would feel a connection to it but I started to cry. It was very emotional and I wasn’t expecting that at all. Our teacher, Mordechai talked about how hard past generations strived to get to this place and he talked about how people have different reactions to the wall but once I got there, it was just very impressive. Q: Would you recommend AMHSI to your friends? A: It’s a great way to get connected with the Jewish community and Israel. This is a once in a lifetime opportunity. Without it, I’d never be able to come to Israel and live through the history!